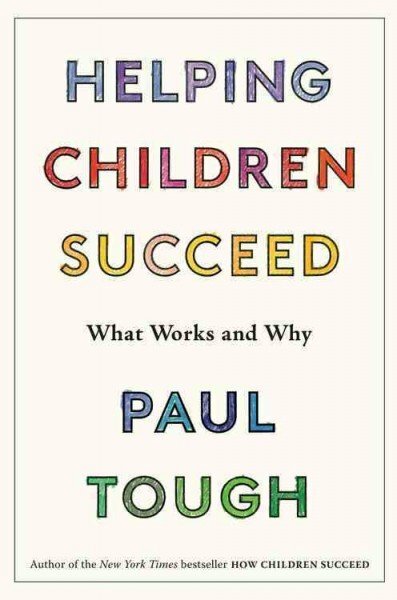 When author Paul Tough released How Children Succeed: Grit, Curiosity, and the Hidden Power of Character in 2012, it spent more than a year on The New York Times bestseller lists and was translated into 27 languages. In the book, Tough combined research from several disciplines to look at how attitude and the learning environment can be good predictors of academic success for children, particularly those from disadvantaged backgrounds. Now he’s back with a new book that builds on his previous work. Helping Children Succeed: What Works and Why explains how parents, teachers and administrators can create environments to foster qualities that lead to success. Tough stopped by the Knowledge@Wharton Show on Sirius XM channel 111 to answer questions about the new release and discuss why his work is so topical. Knowledge@Wharton: Tell us about the reaction to How Children Succeed and how it spurred the second book. Paul Tough: After How Children Succeed came out, I was speaking to different groups of parents and teachers and professionals. It was mostly when I was talking to teachers who were working directly with low-income kids that I would get this question: The stories in the book are interesting. The ideas make sense. But now that we know this, what do we actually do? I realized that I didn’t quite have an answer for that in my book, and a lot of the researchers I’d written about didn’t quite have an answer for that, either. So, that was this new project that I took on to revisit some of the research and find more and put it together into a book that is more of a handbook. It’s more of a guidebook for people who are dealing directly with kids to try to give them ideas about what we can do on a daily basis to help children succeed. Knowledge@Wharton: Then what’s the answer to that question that all these teachers were posing to you? Tough: One of the things that I wrote about in How Children Succeed was this set of skills sometimes called non-cognitive skills, sometimes called character strengths, things like grit and curiosity, conscientiousness, perseverance, self-control. I remain convinced that these are important capacities for kids to have. I think that the problem with the way that I was writing about it, and the way other people have interpreted this research, is that we’re thinking about them as the kind of skills that you can teach in school the way you teach math or reading or geography or anything else. I think the right way to think about them, and what the research suggests, is that they are more the product of a child’s environment. The environment that we create both in the home and in the classroom makes kids able to persevere, to exercise self-control, to behave in all of the ways that are going to maximize their future opportunities. But I think until recently, there hasn’t been a lot of attention put on what those environments are and what adults can do to create them. Knowledge@Wharton: You focus on situations where kids may be in a low-income home, where they don’t have the resources of some of the other kids out there. Tough: Yes. I think we now understand more than we used to, especially from research being done in neuroscience, what it is about growing up in a high-poverty community, in a low-income home, in a family that has a lot of pressure and stress. What does it do biologically to a child’s developing brain and body that sometimes makes it difficult for them to succeed in school without getting additional types of support and help? Part of the book is about that science and trying to explore what a teacher, parent or any kind of professional should know about that science in order to change the way they teach or change the kind of environments they try to create. Knowledge@Wharton: The kids are a major component to this. But just as important are the parents and what they are doing at home to set that pattern, and also the teachers involved in this process. Tough: One of the big things I’m trying to do with this book is shift the responsibility for getting these skills away from the children and toward the adults, which is not to let the kids off the hook. They’ve got to work hard in order to develop these capacities. But I think there’s something about the non-cognitive skill research that inclines us to say, “OK, kids need grit, so they just have to figure out how to get grit, and it’s not our responsibility.” This book is trying to push us much more toward thinking what we as adults can do to help that. Knowledge@Wharton: The majority of parents think about that on a daily basis. The problem is actually implementing this. A lot of parents are so busy with their lives that, unfortunately, at times the kids are not always the first thought. Tough: It’s true. With parenting, we’re always looking for the quick and easy answer. A lot of this research suggests that what kids, especially in early childhood, need most is a lot of what psychologists are calling “serve and return” interactions — those back-and-forth, face-to-face exchanges between babies and parents, that to parents can seem kind of pointless and not particularly productive. But to the babies, these are incredible learning moments where they are gathering all kinds of information about what the world is going to be like, what their relationship with their parents is, who they are in the world, in entirely pre-verbal ways. Neuroscientists are now understanding that those moments are so important in laying the groundwork for the development of skills that matter so much in school and beyond. Knowledge@Wharton: If the home life doesn’t provide all of the qualities that kids need, can the schools fill in some of those spots? Tough: Absolutely. One of the things that I’m trying to do in this book is keep these two ideas in mind at the same time. It’s the best time for us to intervene in the lives of kids, especially those growing up in adversity. But if we don’t get the right kind of support in those early years, it’s definitely not too late. There are all kinds of things that teachers and other professionals, other institutions can do later on in childhood to help. I think it comes back to that question of environments. There’s a lot of research around motivation in psychology that talks about how the kind of messages that kids up through high school are getting from their environment. Messages about belonging, about possibility, about skill, that shape their motivation and have a huge effect on how willing they are and how likely they are to want to work hard and push themselves. Knowledge@Wharton: There are a variety of ideas out there, including paying kids to learn. You are not a fan of that, correct? Tough: It’s the evidence, it’s the data, that I think pushes us away from that. So, yes. There’s this economist at Harvard named Roland Fryer, really a great researcher, who has spent the last decade testing out different incentive programs. Paying parents to come to PTA meetings, paying kids for how many books they read, paying kids for improving their grades. Like a lot of economists, he starts from the point of view that incentives work. To his credit, he’s been very honest with the fact that these experiments have all shown no effect. There’s no lasting effect of the tens of millions of dollars that have been spent on these incentive programs. When you talk to psychologists about this experiment, as opposed to economists, they say, “Yeah, no kidding.” They know, and this study has now helped to demonstrate, that what really motivates kids, like what really motivates all of us, are deeper things than just incentives. Knowledge@Wharton: What are those things? Tough: There’s research done by these two psychologists named Edward Deci and Richard Ryan that resonates with me a lot. It’s called self-determination theory. They’ve demonstrated through a number of research experiments that what kids are really motivated by is not external rewards but what they call intrinsic motivation. The three ideas that tend to push kids toward a sense of intrinsic motivation are feelings of belonging, feelings of confidence and feelings of autonomy. That makes sense to me. When I think about my own work, what motivates me, it’s not so much material rewards. It’s feeling that I’m able to create something on my own that makes me feel good. It makes me feel connected to other people. It sounds a little bit mushy, but I think it’s the reality of what actually motivates kids. There’s a lot in the lives of children in general, and I think especially children who are growing up in low-income homes and communities, that does not incline them to feel a sense of autonomy or belonging or competence. Yet I think there’s a lot that we as adults can do to send those messages in the classroom and beyond. Knowledge@Wharton: Schools play a vital role. What can they do to help this process along? Tough: In Helping Children Succeed, I draw on psychological research that shows how schools, both in terms of the institution and the individual teachers, send these messages about belonging and competence and autonomy. Some of them have to do with discipline. Some of them have to do with just a personal sense of connectedness. There are schools I write about that have these advisory programs, where kids in high-poverty neighborhoods meet together in a group of about a dozen children every morning, with a teacher there as well. They call it “crew,” and they stick with this group through multiple years. It creates for them this real sense of community and connection. They talk about schoolwork, but they also talk about home. Especially for kids who don’t have a sense of belonging outside of school, it creates this intense motivation to show up, to feel like school is a place that they want to be. The other thing I think that schools can do differently has to do with the work that gets assigned. A lot of kids, especially kids in high-poverty situations, are given work in school that is just kind of boring, that is remedial and repetitive and doesn’t feel particularly inspiring. What this research suggests is that giving kids work that is more challenging, more rigorous and more meaningful changes the kids’ level of motivation. It makes them want to persist and want to succeed. Knowledge@Wharton: What is your opinion on the push for charter schools? Tough: I’ve written about charter schools over the past decade, and I still have mixed feelings about them. I think some charter schools are doing some of the best work at creating environments for kids that make them feel that sense of connection, feel that sense of challenge. At the same time, when I look more globally over what charter schools and school choice have done, especially in high-poverty neighborhoods, they have tended to sort of pull away the kids who are from families that are most together, most capable. And as a result, we have certain schools in high-poverty neighborhoods and cities that are more concentrated with kids who are growing up in really difficult circumstances. Those schools are really hard to make successful places. They just need an extra level of support that no school has and that especially these schools don’t tend to have. But for individual kids and individual families, the charter school revolution has been a really positive thing. For the system as a whole, it has had some negative unintended consequences that we have to deal with. Knowledge@Wharton: What role are the textbook publishers playing in not providing a curricula that’s 21st-century ready? Are teachers prepared to teach that type of curricula, particularly in science, technology, engineering and math (STEM)? Tough: There’s a group of schools that I write about called “expeditionary learning schools,” which I think are a really good model of how schools can take a different approach to challenging students. They use textbooks. They use a standard curriculum. But they also do much more imaginative and innovative teaching that I think is much more aligned with 21st-century skills. Kids work on longer-term projects. They work in groups. They work on presentations to the whole school about what they’ve learned. They do much more revision and critique. Rather than just doing that day’s worksheets and then throwing them out, they work on a project through multiple iterations over a long period of time. That is a kind of teaching, to be honest, that is harder. That is more challenging, and a lot of teachers haven’t been trained in that. But when teachers are given the kind of support and encouragement they need to make their classrooms work that way — what some people call deeper learning approaches — it pays off for kids in all sorts of ways.